Here in Southern Ontario the winter of 2011-2012 was the winter that wasn’t. Temperatures were off the top of the charts and we hardly got any snowfall to speak of. Every time it did snow, the snow was followed by rain, so we were back to bare ground within days. I think I shoveled my driveway exactly twice – and it would have melted anyway. I’ve lived north of the 43rd parallel for more than 25 years and I can safely say I have never seen a winter like this. According to NOAA, snow cover across the US and Canada was the third smallest in the 46 years of the satellite record. Across the lake, in Buffalo, NY the normal expectation is that 2/3 of winter precipitation will be snow and 1/3 rain. This year they had 80% rain. Now for many people this was great! No scraping ice from the windshield. No shoveling the driveway. No messy commutes, school closings, or flight delays. For those of us in the north, it was like having March every day. For some, it was more like July. “It’s 86 degrees in Los Angeles today [Wednesday, January 4th],” says Patzert. “Everyone thinks it’s July! In fact, it’s warmer today in LA than it was on July 4th last year. Covering up to 50% of the earth, snow cover is important for a whole bunch of reasons [pdf] having to do with climate and water: It has a major effect on surface albedo (reflectivity) and thus affects atmospheric thickness and surface temperature. 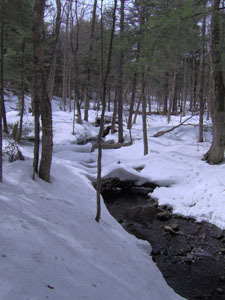 Snowmelt plays an important role in the seasonal energy exchanges between the atmosphere and the ground, so in turn, affects water resources. But there is another interesting thing about snow cover–something right at our feet. Imagine walking through a snow-covered clearing in the forest. Except for the footprints of squirrels, rabbits, and maybe a deer, the clearing seems largely empty. But here’s the thing you don’t see: That snow you’re walking on contains a world of living creatures. In fact, without snow, there is an entire winter ecosystem missing from the environment – the nivean world – that is, the world in, on and under the snow. Take, for instance, the subnivean world — the small space that is created between the snow cover and the earth. Protected by a wooly blanket of snow, the subnivean space has its own climate. Once the snow reaches about 15-20 cm deep, it provides enough insulation to keep the temperature there between -10C and 0C. This creates a comfortable refuge for a whole community of tiny winter-actives– those creatures that do not hibernate or migrate during the winter. This is not a place where cold little animals huddle in shivery groups struggling to bear out the winter. It is a busy place. Intersecting tunnels bustle with mice, voles, moles, beetles, spiders, and grubs. There are sleeping quarters, nurseries, food storage sites, and even latrines. And along the ground, mats of fungi and colonies of bacteria break down organic material. Field mice run about and fetch seeds and berries they cached during the fall. 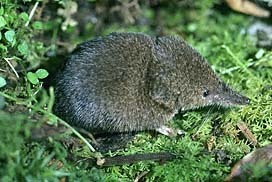 Meadow voles nibble on plant stems, bulbs, and the occasional snail. Shrews, manic little creatures that require constant calories to power their frenetic lifestyle, devour insect pupae, larvae and eggs. If they run short of those delicacies, shrews will dig into their stored cache of live food –voles or mice that they have paralyzed with venom to keep fresh. Entire generations are reared under the snow. Voles and deer mice build communal nests lined with leaf-litter, fur, and dried grasses. With enough adults and offspring huddled together, temperatures in the nursery can reach a balmy 10C. Of course all this activity doesn’t go unnoticed to alert animals on top of the snow. Occasionally the muffled underworld is penetrated by a calamity from above. A slight crunching of snow .. a pause..silence..then crash! Two large feet smash through the snowy ceiling and a vole meets its end in the jaws of hungry fox. Other times the threat comes from within. In Southern Ontario, ermines (aka short-tailed weasel; mustela erminea) expertly hunt subnivean tunnels for meadow voles. They are efficient predators, grabbing their prey (which may be larger than they are) by the head and wrapping their lithe bodies around the victim to hold it still long enough to impart a lethal bite to the jugular. 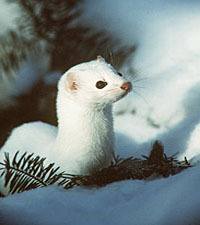 Not only do they eat their prey, but since ermines have given up winter insulation (fat and long coats) in favour of flexibility and speed under the snow, they pluck fur from their victims to line their own dens. But overall, the subnivean world is a protected one. The greater danger comes with not having it. 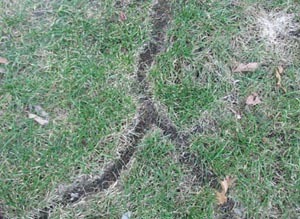 A lack of snowfall can be disastrous to the animals that normally winter beneath the snow. Under normal conditions, voles and mice undergo regular population fluctuations. Field voles in Sweden, for example, cycle on a 3-4 year basis. But that cycle has become interrupted in the last 40 years. Scandinavian studies have found that the winter decline of vole populations has increased in frequency and severity for several species (Clethrionomys rufocanus, C. glareolus and Microtus agrestis) since the 1970’s. That is, fewer animals are surviving the winter. This appears to be linked to “decreased winter quality” — a phenomenon that includes later than usual snow cover, lower snow depth, and earlier and/or frequent mid-winter snow melts. In other words, it’s not harsh winters that kill voles, it’s mild ones. The exact reason hasn’t been pinpointed, but there are several factors that are suspected of playing a role – increased predation due to loss of cover, loss of stored food, increased environmental stress leading to disease, decrease in food quality, and simply, exposure to cold. In addition, the irregularity of snow cover and melt can lead to direct mortality of subnivean animals. Under normal conditions, the most dangerous time for subnivean species is spring. Warmer weather means snow melt, which means water percolating down through the snow into the cavities below. This constant drizzle can cause animals to get wet and die of hypothermia or even drown as water starts running through tunnels. 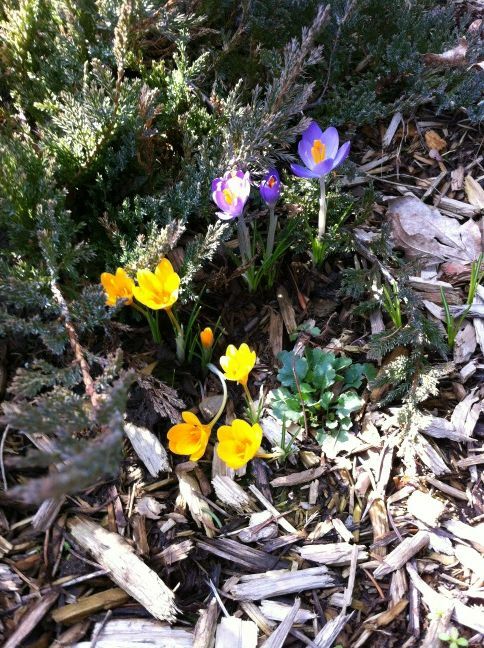 The weather we had this past winter resembled spring over and over again, with cycles of snowfall followed by rain. Not only would this create excessive water, but the subsequent refreezing would fill tunnels, food storage sites, and entry/exit holes with ice. So, as much as our spring-like weather made the winter easier for humans and some animals, it may have meant a serious decline of some subnivean populations. And that, in turn, may have a detrimental effect on owls, raptors, foxes, and weasels and other predators that prey on subnivean animals. So let’s hope for a good snowy winter next year. I’ve lived through essentially the same winter, and I’m not sure we’ll see the predicted effects, as it’s been warmer longer. We’ve had low-snow winters with long cold periods before and seen the observed effects from lack of insulation (a few years ago it involved many mousey home invasions), but I don’t think the foragers have done much freezing this year.